Natural hair might be healthier than relaxed hair, but that does not mean it is invincible. Everyone loves the style versatility of natural hair. It can be straightened, colored, roller set, and blown it out while maintaining its fullness, which is usually compromised with relaxed hair, especially over time. With that being said, hair is still hair. It is merely dead skin cells that are preserved through proper maintenance. Part of proper maintenance and length retention is low manipulation. Since curly and coily hair is naturally drier than straight hair, it is more vulnerable to breakage. Everyone’s hair cannot withstand high manipulation and here are four ways you might be breaking your hair without realizing it. I know women love the polished look of a puff or an updo with smooth edges, but continually putting stress on the hairline can cause breakage. The hairline is naturally fine, so frequently using a boar brush with pomade, gel, or edge tamer can cause the hair to break. It is ok not to have the sleekest edges all day, every day. A little frizz never hurt anyone. If you insist on having flat sides, then consider using your hands to smooth your hairline down, cover it with a satin scarf, and let it sit overnight. Definition and volume is the perfect combo, which is why naturals love doing twist outs and flat-twist outs on dry hair. Many women with short or medium length hair re-twist their hair nightly to prevent tangles and matting. Once your hair gets longer, it is probably best to start pineappling. Unless you are re-twisting in four or five large sections every night, then re-twisting 20 or more sections daily is stressful on the hair. It leads to the same result as fastening your hair in a ponytail every day in the same spot, which is breakage. 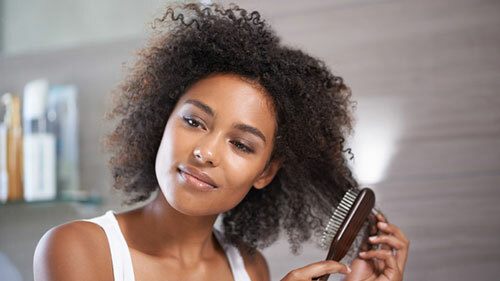 The wisps of hair that you see on your bed, sink, or wherever your twists your hair is a result of over manipulation and potentially a sign for a trim. Remember, the longer your hair gets, the older your ends are. Some people’s hair thrives off of daily co-washing, especially with a TWA (teeny weeny afro), and quite naturally when you wash your hair, you detangle it to avoid matting. Daily detangling can lead to breakage. Before you think about skipping the detangling step when you run a hair under the shower stream, consider this: washing your hair without detangling can lead to a major problem since the hair expands while wet and shrinks while dry. Shed hair that has not been removed will entwine with the other strands as they grow while wet and retract while dry and this can cause matting. So, unless your hair is strong enough to withstand daily detangling, your daily co-washing may be causing breakage.